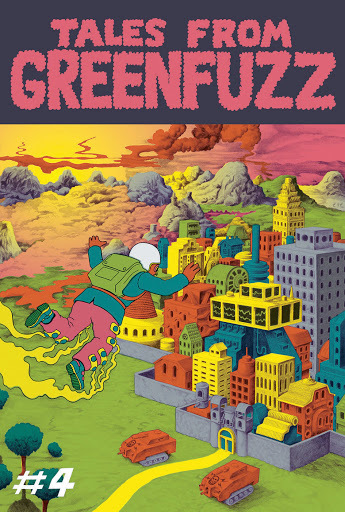 The long awaited fourth episode of Tales From Greenfuzz is finally here! The epic tale of anthropomorphic vegetables, homicidal commodity meat villains and other morally ambiguous creatures continues as the Rastapopolis rebels get their act together and begin to rise up in the face of occupation by the evil fast food forces of Nutwood, commanded by Helmut Von Weinerschnitzel, the hot dog overlord himself. The thrills, spills and bellyaches pile on as Slingsby Sandwich and his trusty companions attempt to escape the Nutwood dungeons and rejoin their friends. Rhonda Broccoli learns of Alaric The Goth's terrible secret and King Rumpus settles a score with an old rival in the ogre castle. On sale now in our shop, £6 + p&p.